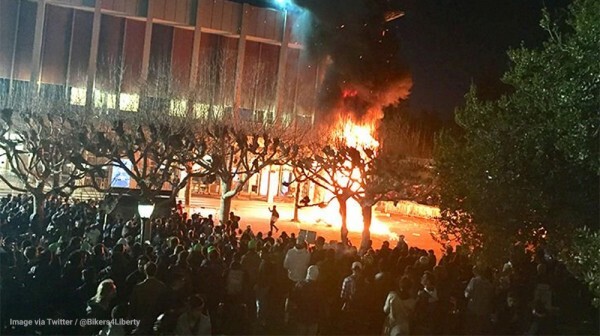 The University of California-Berkeley has taken another giant step towards banning anything that countermands Marxist groupthink with a new report that blames Left-wing violence and campus destruction on conservatives. Rather than hold individuals responsible for their own actions while sending a message that freedom of speech is alive and well at the place where the campus movement promoting political diversity was born in the 1960s, Berkeley officials have chosen instead to sequester opposing thought while blaming their decision on those who are the least guilty. As reported by The Washington Times, a “long-awaited” report on speech protections lays blame at the feet of “hard to defend” conservative speakers who are being accused of ‘inciting’ Left-wing student violence. Well, yeah, because they’re not. So in other words, just by holding opposing political, social, and cultural ideas, they are responsible for the violent reactions of student thugs who directly damaged school property and endangered the lives of some of those who were speaking. That’s like saying because police are on the streets, their presence triggers crime. “Members are skeptical of these speakers’ commitment to anything other than the pursuit of wealth and fame through the instigation of anger, fear, and vengefulness in their hard-right constituency. Speech of this kind is hard to defend, especially in light of the acute distress it caused (and was intended to cause) to staff and students, many of whom felt threatened and targeted by the speakers and by the outside groups financing their appearances,” the report continued, as per Politico. And, just how many poor, unknown Left-wing speakers have spoken — for free, of course — at Berkeley again? This passage is particularly curious because the academic frauds who wrote it have concluded that just by showing up, Right-leaning speakers are seeking to start a rumble. That by choosing to believe opposing political viewpoints or support opposing policies they are purposely trying to provoke others to violence. That’s like saying because a bank opens every morning it is just daring someone to rob it, and then deserves what it gets when someone does. But what are we to expect from people who genuinely see themselves as defenders of our culture, not enablers of uncontrolled rage and violence? As for Yiannopoulos, he pushed back on the idea that he is not interested in having a debate about issues. “I always prefer to give my talk,” he told Politico. “I care about my subjects, But [the report] gets Berkeley off the hook, doesn’t it? For sure it does. But it also deepens our partisan divide at a time in our history when we Americans find ourselves having less and less in common with each other. Read more about reprehensible behavior on college campuses at CampusInsanity.com.